I've been playing with this custom web site for about 5 years. I've watched it grow and grow to the point where I could barely maintain it. The free script library started with a few hundred scripts scrounged from the web. Now the majority of scripts are large, custom scripts written by me, they need to be maintained and refreshed, and meanwhile the lib has grown to 6,051 files, 4,126 folders and 322 megabytes. There are now multiple libraries with 1,429 free seamless textures, 318 Collada DAE files, 466 wavefront OBJ and sculpt files, 1,602 Linda Kellie zip files with XML, IAR and OAR objects, 1006 projects with 1552 scripts written by over 500 people, plus all the posts with original content and my own private collection of 29,472 Files, 6,227 folders in 25 GB of complete and in-process stuff that Waving Girl and I share so we can work on Phaze and OpenSim. And then there is the web site. I recently took about a month off from fun things like making stuff, and updated all public scripts with metadata so they are safely under a source code control system and dynamic zip generator. As a direct result. the stats for each script are going to be a little harder to get for 2013 as compared to prior years since all my databases changed. All stats are for the calendar year 2013 and are taken from my own SQL databases or Google Analytics. I don't run any creepy third party services that collect stats, or serve ads, or spy on you. So my stats will be more limited than say, this one, which has an unbelievable 50 trackers on it. 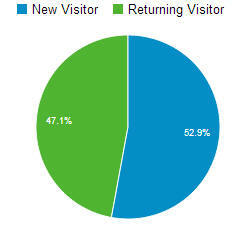 Unique Visitors is the number of unduplicated (counted only once) visitors. Most of these visitors come looking for scripts. 3.41 Pages/Visit (Average Page Depth) is the average number of pages viewed per visitor. I don't split things into multiple pages ( more info after the break) to artificially increase this. People come back again and again for good content. They go back again and again to libraries. I have no advertising, so essentially all my traffic is organic, from search, or links on other pages. While the wonderful Maria Korolov of hypergridbusiness.com has always been a top referer, this is the first year that a blogger, Chimera Firecaster, has reached the top 10 referers. 2 hypergridbusiness.com 887 Maria Korolov - the only news source for Second Life and Opensim. 4 kinggoon.co/ 684 A buncha copybotters and ripped content lusers. A lot of them. Beats me why they refer traffic to me. Probably because they can't copybot scripts, ya think? 7 wiki.secondlife.com 495 People asking for help with my scripts. For some reason they always don't ask me. Search engine traffic over time indicates a gradual falling off in LSL script traffic even after the glory days of 2007. Search for LSL Script on Google Trends. People looked at the list of all scripts 42,208 times in 2013. The most popular scripts for month of December. These are not views, but actual downloads. I cannot give you a yearly total or more details due to the change in database formats. But this is fairly representative except for the Make Snow, which is seasonal. My site is divided into static pages and a set of articles (posts) about tools and things in Second Life and OpenSim. This is similar to WordPress. I have very few actual 'pages' that show up in the first 250 things that Google indexes. The Radio player script blew away all the other posts this year. I have a newer, sleaker radio player, too, and it is not reflected in these stats. You have to get it on the marketplace and yes, it is free. I have yet to sell anything for linden dollars, since August of 2006 when I first joined. I only track in-world visitors by the month using my own custom software here. We had 1,633 unique Second Life citizens visited in December. On average, about 19,596 unique visitors came to Phaze Demesnes last year.